Many people love the look of real stone but due to the weight of traditional full bed stone have until recently been unable to use real stone. It used to be the only way you could get the look of stone without reinforced foundation work was to use a manufactured product. Advancements in diamond blade technology now allow manufacturers to cut thin sheets of real stone to create granite and other stone veneers. There have been many quarries popping up throughout Ontario that produce various thin cut natural stone veneers. These thin veneer pieces look just like real stone because they are real stone. Since they are roughly 1 to 1 1/2 inches thick they can be applied using the same techniques as any other manufactured stone veneer. Thin cut stone veneer is available at most stone yards. In many cases it costs almost the same as manufactured stone. 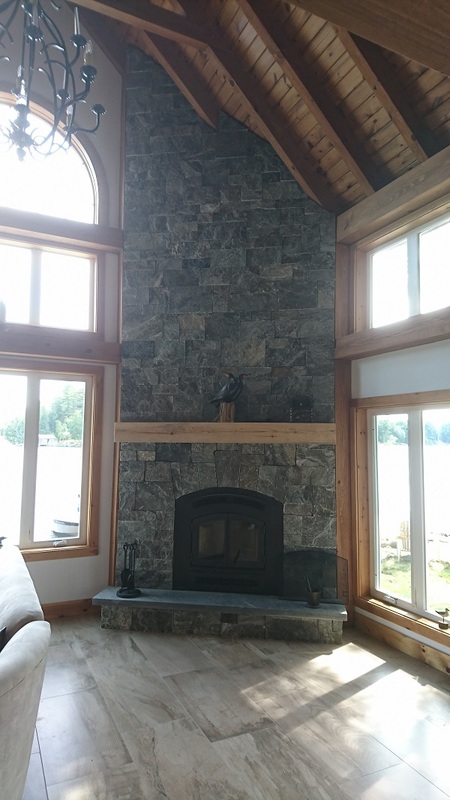 The project discussed in this blog features thin cut granite stone veneer applied to a corner wood burning fireplace. 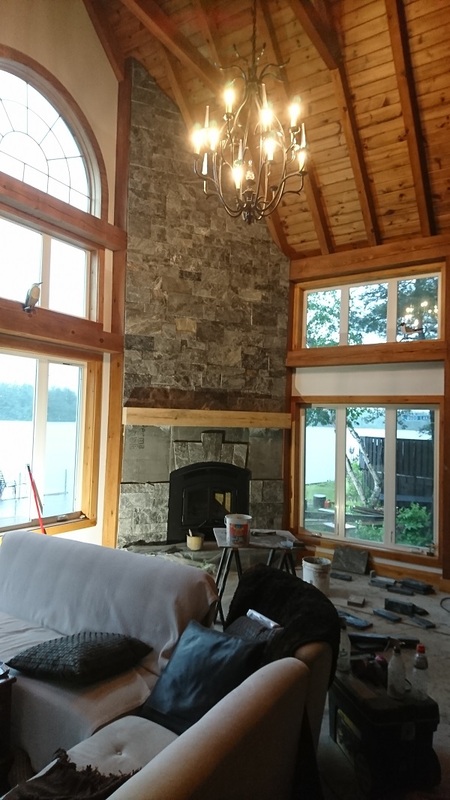 The year round cottage, located north of Huntsville, was in need of a fireplace and the owners loved the look of real stone but were less than thrilled with the high cost of installing full bed stone. The solution in this case was to use a thin stone veneer in a square cut pattern. 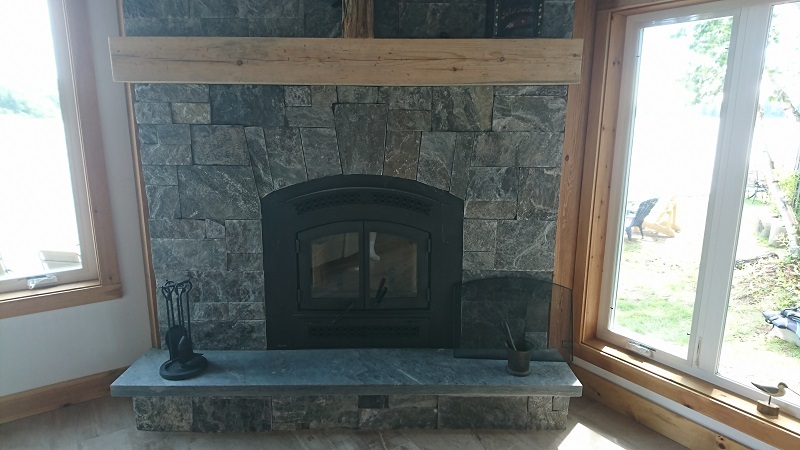 A corner fireplace with thin cut granite veneer. 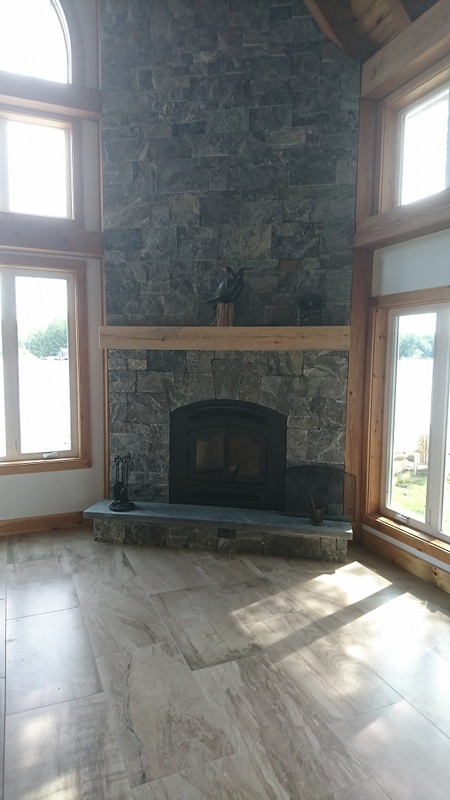 The image to the left shows a close up of the stone veneer fireplace which highlights the feature above the fireplace opening. In this case the feature was made by cutting a few of the stones to create a clean arc around the fireplace doors. The feature really enhances the overall look of the fireplace. A similar granite veneer fireplace with a feature above the doors was the subject of one of my previous blogs. Granite veneer fireplace before full completion. Thin cut veneer being applied to cement board substrate also showing feature. 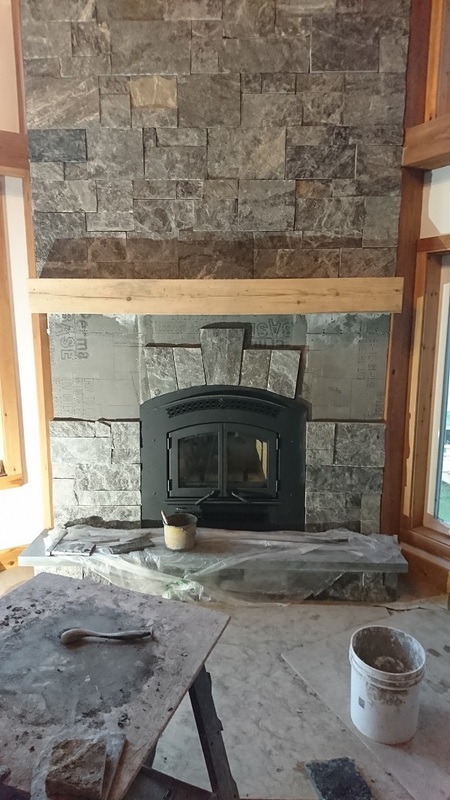 Completed fireplace showing feature and 3 inch thick full stone piece for hearth.